Every time I worry about the lack of big band jazz groups within the United States, I find another European ensemble that is keeping that genre alive; such is the case with this marvelous orchestra from Switzerland. This is the first release from a project that features “Bandstand Learning with Role Models.” Young apprentices — their ages ranging from 16 to 26 — are mentored by great professionals: trumpeter Randy Brecker, vibraphonist Mike Mainieri, pianist Christian Jacob and drummer Rodney Holmes. These nine tracks were recorded at the Jazzaar Festival held in Aarau, Switzerland, in 2014. All but one (“Beirut”) were written especially for this orchestra by its director, Fritz Renold. The style echoes that of the jazz fusion band Steps Ahead. All but one of the tracks are done at mid- to up-tempos; the exception (“Mandela”) is a moving ballad. Including the special guests, the orchestra features six trumpets/flugelhorns and three trombones; five reeds, one of whom plays an ewi; a rhythm section of piano, two guitars and two basses; and another percussionist. The liner notes don’t specify, but some of the duplicate instrumentalists probably aren’t utilized on all tracks. We may not have as much big band jazz here in the States as we’d like, but the Swiss sure have their share; don’t miss this contribution. In the beginning, the acoustic bass was a key instrument in the rhythm section: one that set, and helped maintain, a steady “beat” in the orchestra or combo in which it was used. It rarely was used to play a melodic line, unless a bow was involved. But that changed as time passed; the instrument evolved, and the artists’ skills improved. Today, you’re just as likely to hear complex melodic lines and solos featuring that “horn,” as on brass or reed instruments. Icons such as Charles Mingus, Ray Brown, Niels-Henning Orsted Pedersen and David Friesen — the artist featured here — have led the way. Did you ever imagine attending a concert where a solo artist performed on the acoustic bass? Friesen has done that. 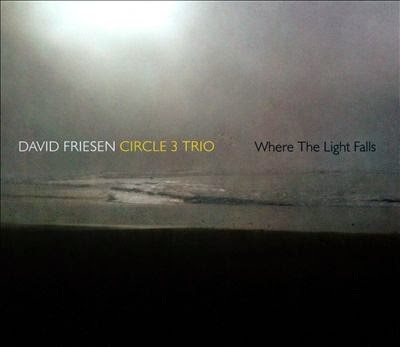 This double-CD release, however, features his Circle 3 Trio; he’s supported by pianist Greg Goebel and drummer Charlie Doggett. To make this splendid combo even better, guitarist Larry Koonse appears on nine of the 19. Friesen composed and arranged all of the music, which is another treat. He was born in 1942 in Tacoma, Washington, to a musical family; his father sang, and his mother played C-melody saxophone. David grew up in the Spokane and Seattle areas, and began his musical career as a guitarist. However, while in the army he became enamored with the upright bass, and taught himself to play it. He was immediately hooked, practicing up to 10 hours a day. Although he was exposed to — and often sat in with — many jazz icons who passed through the Seattle area, Friesen didn’t move until 1973, when he opened his own coffee house in Portland, Oregon. Guitarist John Stowell joined Friesen in 1977, and they toured the West Coast together for years. Goebel is another West Coast artist. His home territory covers Oregon, and that’s where most of his performances are heard. Doggett is another Oregonian who also can be found at the state’s various jazz clubs, particularly around Portland and at the two major colleges: the University of Oregon and Oregon State. Readers of this blog know that Koonse is one of my favorite guitarists. His instrument of choice on this release is an electric model, and — as always — his contribution is impeccable. The key words for this release are tasty and beautiful. These two hours of intelligent jazz will keep you riveted to the speakers. Months have passed since I’ve been able to review a truly excellent female vocalist, and even longer since I found somebody backed up by equally excellent musicians. Well, today’s the day. Joanne Tatham is the main attraction, and she’s supported by primo artists such as pianists Tamir Hendelmen and Jamieson Trotter; bassists John Clayton and Lyman Medeiros; guitarist Marcel Carmargo; saxman Bob Sheppard; and drummers Peter Erskine and Mike Shapiro. The combo sizes, depending on the track, range from simply the guitarist to trios and quartets. Tatham is new to me, but not to New York or Los Angeles; this is her third album. She began her career as a Broadway musical comedy performer, then moved to L.A. Her voice is simultaneously lush and swinging; every note is precisely on key, and her transitions from one note to the next are soft and swinging. As one example, in the opening chorus of “You Taught My Heart to Swing,” she joins the instrumental line so perfectly that it takes several seconds to realize her voice is part of the phrasing. And wow, what a voice! I’m also impressed by Tatham’s set list. These aren’t tunes commonly associated with the Great American Songbook, but much of them still sounds familiar ... not surprising, considering her Broadway background. Example include Harry Nilsson’s “Without Him (Her)”; Bob Dorough’s “Devil May Care”; Herbie Hancock’s “Tell Me a Bedtime Story,” also heard on TV’s “Fat Albert”; the jazz standard “Detour Ahead”; “Cool,” from “West Side Story”; and the title tune, from the musical “Oklahoma!” They’re all marvelous. This is a stunning album. I’m eager for more, and I hope that Tatham will be blessed once again with a similarly talented cadre of musicians. 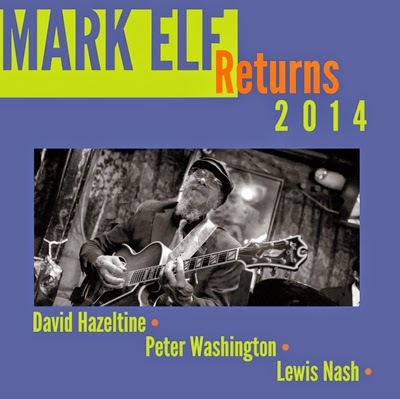 Guitarist Mark Elf, born in Queens, New York City, began playing at the tender age of 11, and has performed with some true jazz giants during his subsequent 30-year career; Dizzy Gillespie, Clark Terry, Wynton Marsalis, the Heath Brothers and Jon Hendricks are the most famous. Elf began to teach in the 1970s, both in the States and overseas, and he formed his own recording company (Jen Bay) in 1995; this is his newest release. Elf recognized early that being from the Big Apple was, at times, a disadvantage; the surrounding area boasts far more musicians than potential jobs to support them. As a result, Elf became impressively successful at the art of selling himself, particularly on jazz-oriented public radio stations. This album features his quartet — David Hazeltine (piano), Peter Washington (bass) and Lewis Nash (drums) — on all but one track; a second percussionist (Steven Kroon) joins the group for the remaining cut. Elf wrote seven of the 10 tunes, and the rest are Great American Songbook standards: “It Was So Beautiful,” by Freed and Barris; “Time on My Hands,” by Youmans, Adamson and Gordon; and “People Will Say We’re in Love,” by Rogers & Hammerstein. I’ve always loved the combination of piano and guitar in a tightly knit combo, and this release truly soothes my soul. You’re bound to enjoy it just as much. You can determine a musician’s talent by the quality of the artists who’ve performed with him during his career. 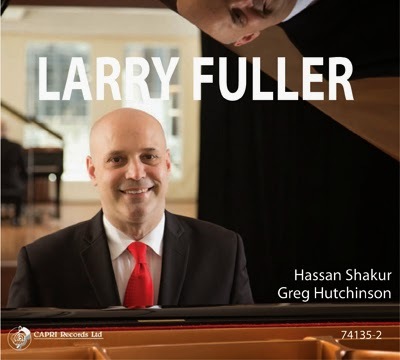 Bearing that in mind, all you need to know about pianist Larry Fuller is revealed by his discography. He spent six years as accompanist for the legendary blues and jazz vocalist Ernestine Anderson; he was part of drummer Jeff Hamilton’s trio, and then bassist Ray Brown’s trio, until he died in 2002. Fuller then joined guitarist John Pizzarelli’s quartet for eight years, and now freelances with other artists and his own groups. This album is just the second under Fuller’s own name; after all, who has time for that, when he has been part of dozens released by the aforementioned leaders? Fuller loves all jazz genres, and he performs them flawlessly. The dozen tunes here include compositions by artists as varied as Cole Porter, Ray Brown, Joni Mitchell, Oscar Peterson, Duke Ellington, Johnny Mandel and others. Fuller is supported by bassist Hassan Shakur (son of J.J. Wiggins) and drummer Greg Hutchinson. Both have equally busy and name-checkable résumés. Needless to say, everything swings: a very refreshing album by an excellent trio. I’ve discussed many jazz composers over the years, but none had a birth date going back to 1874 ... that is, until this music from Charles Ives. His father was a famed bandmaster in Danbury, Connecticut, who was known for his “radical” performance ideas. Young Charles learned to play the piano and organ but, more importantly, became a masterful composer and arranger. Although he grew up to become a wealthy businessman — he owned and ran an insurance company — his musical compositions made him famous. He won two Pulitzer Prizes during his lifetime. Jack Cooper, born almost a century later, is one of the many modern musician/composers who’ve been highly influenced by Ives (Bob Brookmeyer is another). 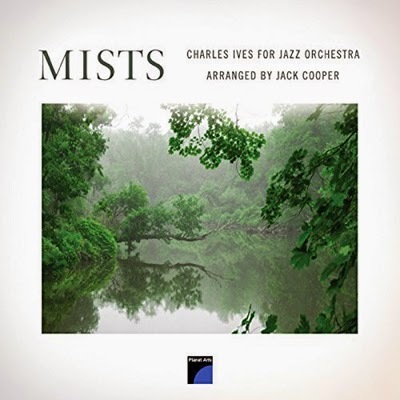 This album is the result of a project that Cooper began, intending to meld Ives compositions, along with relatively advanced tonal and rhythmic phrasing, with the styling and “feel” of modern big band jazz orchestras. Eight Ives compositions are featured on this release. Most probably won’t be familiar to the average jazz fan; one exception might be “At the River,” a tune usually associated with the country and gospel genres. It’s amazing, however, how modern and “familiar” all these songs sound, relative to the music we’ve long heard performed by swinging big band groups. Not to mention how great the instrumental solo passages sound, as they’re laid atop the melodic passages. Ives must’ve been a time traveler, and Cooper a like-minded soul who has broken the code for this realm. You’ll be amazed at the results. I grew up during the years of big bands and their vocalists. Who can forget the likes of Sinatra, Torme, Eckstine, Darin and dozens of others? Many of them began as “swooners,” but as they aged, they became swingers. Vocalist Paul Marinaro’s father, Joseph, sang in that style; today, Paul sounds like a grown-up version of his dad. This album is a labor of love by Paul and his musical friends, as they revisit some of those past gems, along with several of today’s better ballads. One of Paul’s gimmicks incorporates dubbing old home recordings that his father made years ago, and blending them with his own renditions. The result is both polished and endearing. This album’s backup artists also are way above average: Chris Sargent, Chris White, Judy Roberts and Tom Vaitsas, piano; Andy Brown, guitar; Joe Policastro, bass; Jon Deitemyer, drums; Greg Fishman, tenor sax; and Marielle De Rocca-Serra, violin. Paul’s vocal prowess is excellent, but the band deserves credit for much of the CD’s total impact. Paul does ballads beautifully. His voice is clear and expressive, and he’s particularly adept at adding variations to the melodic lines. And, to avoid obvious duplication during multiple repetitions of a given verse, he includes solo choruses by his sidemen/women, all of which fit in nicely. This may not be the pure, swingin’ jazz that I favor, but it's nonetheless very enjoyable. Larry Koonse started to play guitar at age 7, and was only 15 when he recorded his first jazz album with his father, Dave, also a guitarist (Father and Son Jazz Guitars). I covered one of their more recent collaborations several years back — Dialogue of the Heart — which led to infrequent but always engaging correspondence with Larry. He sent along a discography of his other releases — there are dozens — and I’ve made it a point to catch up with as many as possible. He’s a master of his instrument, and one of my favorite artists. 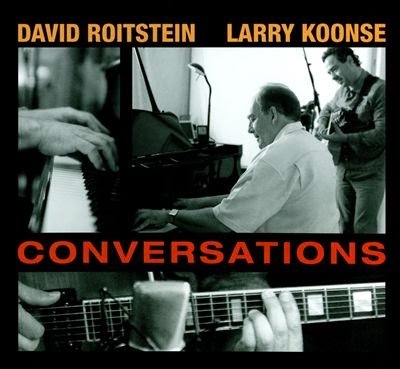 Conversations, a duet with pianist David Roitstein, is one of Koonse’s newest releases. He and Roitstein composed six of the 10 tracks; the others come from Darek Oleszkiewizk (bassist on many of Koonse’s albums), Lea Freire, Antonio Carlos Jobim (“Luiza”) and Thelonious Monk (“Think of One”). Jazz can swing; it can be joyous; it can be beautiful. Occasionally, it can be all of these things at the same time. On this album, Koonse and Roitstein have achieved that pinnacle.